This week’s honoree: Leg Up for Cleveland’s Kids. Every Friday, Horse Nation teams up with Ovation Riding to spotlight an individual or organization doing good work in the horse world. 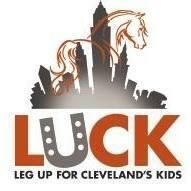 This week, we’re recognizing Leg Up for Cleveland’s Kids, or LUCK, an urban equestrian program based in Cleveland, Ohio. Partnering with the Cleveland Mounted Unit, LUCK helps foster positive interactions and relationships between youth and law enforcement. Participating youth learn to care for and ride horses, which has been proven to have multiple benefits for young people including increased sense of responsibility, empathy, social-emotional skills, motivation and more. LUCK was founded in 2016 by four equestrian women who sought to bring those benefits to Cleveland’s youth. Originally running as a two-day immersion pilot program at the Chagrin Hunter Jumper Classic, the program has expanded since, holding 11 programs of various lengths. In the current model, students are bused from Cleveland to partnering stables in the Chagrin Valley. In the future, LUCK hopes to create long-term partner programming with the Cleveland Mounted Unit and eventually build its own equestrian center, allowing it to expand its offerings and increase its impact on the Cleveland community. With its current program model, LUCK does not yet have a wide need for volunteers, but is always accepting donations. As programs expand, more volunteer help will be appreciated! To learn more about Leg Up for Cleveland’s Kids, please visit the organization’s website and follow on Facebook.